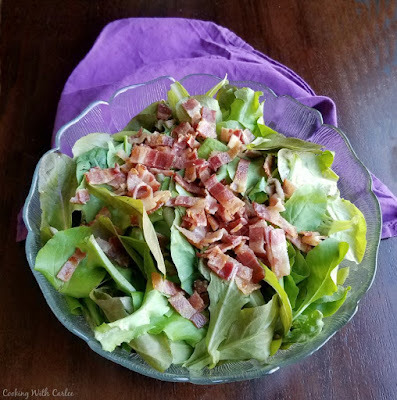 This vintage recipe for wilted lettuce with bacon is the perfect way to eat leaf lettuce from the garden. 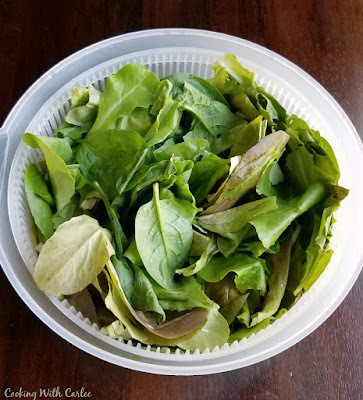 Have you ever had a wilted lettuce salad? It was always one of my favorite salads growing up, but I got out of the habit of making them. When MiMi gave me a bunch of fresh leaf lettuce from the garden I knew I had to dig out the recipe and bring it back. There is just something about the slightly sweet and really simple salad that draws me in. Of course the bacon doesn't hurt! It always feels a little strange pouring the warm dressing over the salad. 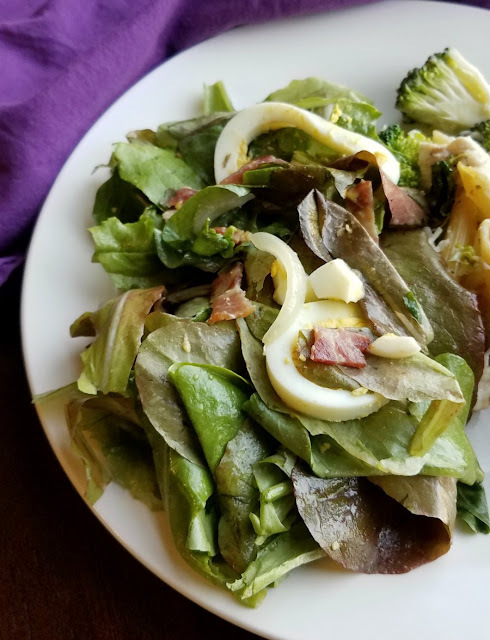 Wilting leaves is usually the enemy of salads, not the intent, but whoever came up with this one knew what they were doing! I can't help but wonder if the first version of this salad was a mistake though. A hurried cook realized they ran out of oil and used hit bacon grease perhaps? Then after a bite they were hooked?! Who knows? No matter the origin, it's a tasty creation. My husband was quite pleased with it as well. He isn't a huge salad fan and normally only eats them loaded with toppings. But this simple salad won him over despite himself. I think most recipes have you include the onions raw. 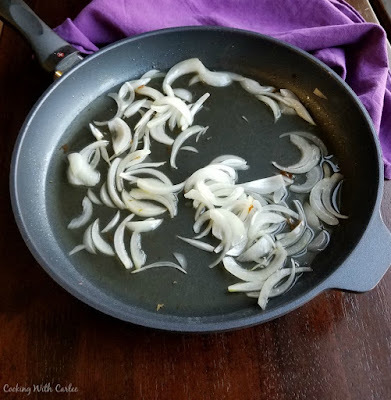 I am not a huge fan of raw onions, so I like to cook them until they are just translucent in the bacon grease and just stir them in as part of the dressing. It takes the edge off of them and makes them more enjoyable for me. Luckily I just got a bunch more fresh lettuce from our CSA box, so there is more wilted lettuce in our future! Some of our other favorite simple side salads using fresh garden produce are caprese quinoa salad and creamy dill cucumber salad. What are your favorite fresh garden sides? Thoroughly wash and dry lettuce, the place in a serving bowl. In a skillet, cook bacon until crisp. Remove bacon to cool on paper towels, but leave bacon grease in the pan. Thinly slice onion and cook in bacon grease over low heat until it begins to soften. Chop bacon and hard boiled eggs and place in serving bowl with lettuce. Pour warm bacon dressing over the salad and toss to coat. Serve immediately. So yummy. I still have plenty of lettuce so I must make this and the spinach salad that is very similar to this. Please visit our garden and pick lots more lettuce - and help yourself to some radishes too! I was thinking about the spinach salad too. That is one of my favorites as well. I need to get my hands on some spinach! 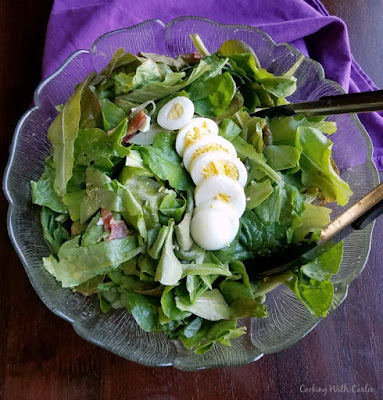 My favorite Summer salad as my mom made something very similar as I was growing up with all of our fresh from the garden lettuce! Happy Fri-YAY! Isn't it the best? I need to make more! What a great way to switch things up! I first heard of this a couple years ago and forgot about it. I really need to try this! I hope you love it, it's one of my favorites! I have never had wilted lettuce salad on purpose - haha! I guess that I am going to have to break down and try this as you make it sound so good. I think that your theory that the first person who made this salad may have made it by mistake may be correct - it makes you wonder doesn't it? It almost had to be a mistake, but a delicious one! you'll have to let me know what you think when you try it! Yummy! These is a restaurant in Des Moines that makes a delicious warm bacon salad and now I can make it at home! Yay! I hope you like it as much! It is one of my favorites too! I only think to make it a few times a year, but then I always wonder why I don't do it more! YOu seriously know the way to my heart!!! Thanks for sharing on our pork recipe link up! It is definitely a classic for a reason!